Tesco's Fresh & Easy Headed for Closure? Make Your Data Last. Forever? I found this Ars Technica series about writing computer programs interesting. In part of my early enterprise career I did this for executives. Explaining to them why computing was useful, and enough training to let them know what could and could not be done easily. They were rarely interested in how computing really worked. The way most of us do not care how our car engine works, just that it does, reliably and cheaply. The more philosophically minded would sit down for an overview of the details, but that did not mean that they could write something that would be useful. In the early days there were exceptions. I worked with an executive who could use Basic or Fortran or a Spreadsheet to do some calculation. But as the years progressed the languages evolved to Java and C++, and their programming contexts and databases became involved. Just like I can describe to you, in theory, and in some detail, how a car engine works, I am inept at actually repairing one. The Ars series are good introductions. I am not sure who they really help. Executives? Middle management in IT? Not IT professionals. Is this writing for computers? Very good HBR piece on the use of social customer connections to build your business. How do you get customer advocacy to work for you? Marketing, Product Development and strategy development in a company simply do not have enough activity connections to their customer base. Nicely stated short piece. " ... First, find the core of customers who are passionate about you. One effective way of doing this is simply to ask them the "net promoter" question: how likely would you be to recommend us to a colleague or friend? Then, for those who respond to the survey with "highly likely," make it easy for them to do so right then. Technologies exist that allow them to easily post a recommendation to their Facebook friends, LinkedIn connections, and Twitter followers. Or to provide a product review on any site important to your market. Or to upload a video singing your praises. ... "
In GigaOM: MiGym is designed to better connect the health club exerciser and the customer. Quantifying the health club workout. I like the general idea, though there could be elements of gamification included. Could the same thing be done with any health issue? Sharing with a community of professionals and basic customers alike. Viewing distribution models. " ... With direct sales forces under heavy pressure and channel partners becoming scarcer as the reseller market undergoes shifts, a new type of distribution that encompasses both and more is emerging. This new model takes into account not just general sales tactics; it also considers the latest in social, CRM, app-usage and help-desk technologies. ... "
How do you build a better personal business network? From Knowledge at Wharton. Good piece: " ... successful networking goes far beyond handshakes and business card exchanges, noted speakers at the recent 14th Annual Wharton Women in Business Conference whose theme was "The Building Blocks of Success: From Asking to Acting." The strongest connections develop through shared experiences, and cultivating a network requires thought, organization and attention. Relationships may not pay off for many years, panelists pointed out: To sustain them, they need to be real. ... "
In Innovation Excellence: Culture is essential for innovation to work. The real culture. I have been in organizations where the apparent culture promoted innovation, but the actual culture hampered it. Figure yours out, change it or adapt to it. Find others that can collaboratively promote the changes needed. During the early days of our cognitive science work we often asked this question. Who among Fortune 500 companies have used techniques to measure and understand the non conscious interaction between consumers and products. What techniques did they use and how did this help their business strategies? How did this compare to classical methods of understanding the motivation of consumers? Neurorelay provides a good overview this work by a number of well known companies. These examples are not case studies, but indications of the kind of research still under way. Much was also done non publicly during this time period. This link is a good place to understand the range of investments underway in this space. In IEEE Spectrum: Will this system end by 2018? The 134 year old public phone network is dying. What are the implications of changes to the network and how data travels among people and machines? Or is it entirely about machines and infrastructure? " ,,, More and more businesses and households are trading their traditional switched telephone service for voice over Internet Protocol, or VoIP, services. That’s led to a paradoxical situation, where a huge number of phone calls start out as Internet packets and end up as Internet packets, but have to be switched to, and then from, a voice circuit on the old-school public switched telephone network. Universal Internet Protocol would allow telecom companies to meet the same demand with much less equipment. Seeing the possible financial benefits—including turning suddenly redundant real estate into cash—AT&T, the largest phone service provider in the world, called on the U.S. government to set a final date for the last plain old telephone call. “Techwise Conversations” host Steven Cherry talks with Daniel Berninger, founder of the Voice Communication Exchange Committee. This Washington, D.C.–based telecom advisory group has chosen the date for the completion of the transition to the Internet Protocol. ... "
I don't normally like yearly predictions. But I found these to be thought provoking. They all deal with the long proposed suggestion that increasingly transparent information, among multiple players, about the operation of supply chains will make them much more efficient. The links with big data analytics are clear. It is suggested that " ... Fast Data Will Become the New Big Data ...Big Data is everywhere, and we deal with our fair share in today’s complex manufacturing environments. But what is perhaps more daunting is Fast Data – that is, the incessantly changing positions of forecasts, orders, shipments and inventory. This challenge is complicated enough within the virtual enterprise, and becomes downright overwhelming in the context of global trading networks – with multiple tiers of partners trying to manage information changes across unique operating systems.... "
From Inside Analysis. Here I disagree in one sense and agree in another. . It is true that it has never entirely been about the size of the data. What we have seen is that we are moving away from the hype that has been seen in the last several years. As I have said here many times, it is about what you can do with new data, large or small. It reminds me of the view of artificial intelligence in the late 80s. Where a rapid change in perception caused a whole market, with valuable insights, to collapse. Good piece other than that assumption, and the perhaps unintended consequences. In CACM: News aggregation is a common thing in the internet. Many sites and blogs find news in their specialty areas, and the results are redistributed to different markets. This information is often commented upon and re positioned for new readership. A value added model. That is what this blog and its predecessors have done, first within the enterprise, and then externally. It also seeks to provide value in small doses that are easily scanned. What are the legal and value implications of this approach? More on the topic. Akin to the $99 laptop, the $99 tablet, which I wrote about in the enterprise some long time ago with the hope of getting some support to drive it world-wide. Is the tablet the new standard ? Is this the ultimate reduction of scale, to drive all of the world-wide community to the web? And what will be the implications for innovation? Battle testing an innovation strategy. In the McKinsey Quarterly. This does remind me of defense department approaches, that were reimplemented in big enterprise. Essentially a simulation approach. Possibly with game theoretic additionas. Though this has been done typically for tactical rather than innovation goals. " ... By simulating the thoughts, plans, and actions of competitors, these companies are improving their products and services, while gaining a deeper understanding of how their innovation assets compare with those of rivals—insights that help them better identify, shape, and seize opportunities. ... "
Mintel releases some holiday shopping behavior statistics in Progressive Grocer. New and appears to be quite interesting. Including: " ... Our interview with Principal Scientist at NASA, Ashok Srivastav ... ". Registration required. Via Linkedin. A Paper.li collection of information about storytelling ideas and technology. Selling high tech ideas at B-Reel. An example of using a mix of digital and other media to sell product. Some interesting examples of 2011 are described. Storytelling and technology, ready for 2013. We never used the well known Myers-Briggs personality test for specific decisions. But it was promoted as a means for self-understanding. I was convinced it was useful for broad brush analyses, but the results were frequently over analyzed. We like to know about ourselves. A piece in the WP. My former colleague Julie Anixter interviews Whitney Johnson about using dreams as a vehicle for disruption. " ... Join me for the webinar interview Innovation Excellence did recently with author Whitney Johnson, whose book, Dare, Dream, Do, is interrupting or better yet, disrupting our notion of the role of dreaming in innovation and in life, and in doing so, challenging us to rethink what dreams mean to us. ... "
Rexamining a company, Charlotte Software Systems. We had worked with their CEO Kevin Kostuik, when he and other people there worked with former component BiosGroup and then NuTech. The company was bought by Netezza, which was then folded into IBM. Charlotte is now an independent company. We used some of their methods to address genetic and optimization solutions to such problems as project portfolio analysis, supply chain design and product development investment. Worth a look. Will report more here as I can. Pass me any experiences you have had.
" ... Charlotte Software Systems specializes in cutting-edge optimization software to support enhanced tactical and strategic planning. Our systems can help optimize a number of complex business processes from large scale resource scheduling to strategic asset allocation. ...The foundation for our solutions is a powerful modeling and optimization platform upon which we capture the intricate details of your specific business process. Our solutions are delivered with attractive user interfaces which allow business specialists an intuitive way to manage their process. The resulting application is precisely tuned to fit your business while leveraging a proven platform of advanced optimization technologies. ... "
GigaOM points to the fact that if we had more easily used data, we would not need more data scientists. Scientists are useful, but we need the leverage of intelligent software, visualization and easily used and adaptible infrastructure. I note this links well to Intuit's plan to bring data and associated analytics to everyone. Small to medium sized companies and even individuals can benefit. Will Apple passport updates that will include NFC wireless transform shopping? In Mashable." ... A newly discovered patent application hints that Apple is planning to update its Passbook digital-coupon storage app with Near-Field Communication (NFC) technology. This means future iPhone and iPod touch products may come with location-based technology that displays relevant coupons and gift cards as soon as you're near a store. .... "
Modeling People and places from collections of online photos. Variants of this idea have been tried before, but this approach takes a broader view. A good example of using accessible big data image collections. In CACM: Interesting thoughts on technical big data examples and solutions. Like this: " ...When a new user visits the online music service Pandora and selects a station, the company's software immediately generates a playlist based on the preferences of its community. If the individual creates a Chopin station, for example, the string of songs would consist of the most popular renditions of the composer's music among Pandora's community. Once the new listener inputs a rating, clicking on either the "thumbs up" or the "thumbs down" icon, Pandora factors this preference into future selections. In effect, the service becomes smarter with the vote of each thumb. ... "
Its all about Memes. We believe what we want to. The evidence of increasing amounts of 'following' do not necessarily imply truth, only how interesting the claim itself may be. Something pictorially sensational will increase interest. Depending on later context, there may never be self correction of a false claim. Both true and false claims remain online. The more sensational is more likely to be found during a subsequent search. So the internet cannot be assumed to be self correcting. In Ecommerce Times: A pretty broad view of what gamification means. Is it just Loyalty points? And sharing their level? It is a useful way to think about the loyalty idea, and start there as opposed to looking for an extreme game gimmick. " ... Airlines have built some gamification into their frequent-flier programs as they reward their best customers with elite status at certain earning levels. However, few fliers would describe their airline's loyalty program as fun or engaging. Few frequent flier programs offer challenges, competition with other "players," or an active community that allows fliers to compare their statuses and compete with each other.... "
About to dive into a project using Windows 8. I have been researching its use. Wharton takes a look. I see that Wolfram Research has some new discounted ways to purchase Mathematica and Wolfram Alpha that are available through December 31. See more here. Also see their latest blog post, on the predictive user interface: What are You Going to Do Next? : Introducing the Predictive Interface. What looks to be a useful free course, emphasizing biostatistics, in Coursera, starting January 22. " ... This course will focus on how to plan, carry out, and communicate analyses of real data sets. While we will cover the basics of how to use R to implement these analyses, the course will not cover specific programming skills. Computing for Data Analysis will cover some statistical programming topics that will be useful for this class, but it is not a prerequisite for the course ... "
Useful predictive commentary on the upcoming changes in logistics and related context and technologies. Via Fabrizio Brasca is vice president, global logistics, JDA Software. He is responsible for developing innovative transportation and logistics strategies across all industry verticals. On the BBC: " ... Online, English has become a common language for users from around the world. In the process, the language itself is changing. ... " . Changing the process will change the data that flows through it. RecordedFuture maps the location of big data efforts in the US in the coming years. In their Blog. Also provides access to the data it used in their unique future data exploration visualization method. This allows you to overlay future mentions of events and plans, the ability to manipulate the timelines to match your particular intelligence needs. Dive in. Note that this is an example of democratizing data that has been semantically placed in time. Further it tells a story, a time narrative of predicted events. Simple, but often very telling about a technology topic like analytics with big data. Is data science storytelling? Yes, in the sense that everything that is analytical tells a narrative story. It must fit into some sort of preexisting narrative. So there has to be interaction with the storyteller, and the story itself, to make sure the receiver of the narration understands the point. Interaction is key because the conversation is not one way. The receiver of the story needs to understand how it fits into their own decision process. So in the sense of a story that is only told to make and emphasize a point, the answer is no. A good story is more than that. In the HBR Blogs: A video interview with Alexandra Samuel. Some interesting points here. Yes, I believe this can be done, selectively. I do not yet believe that managing the process can be effectively done with today's social media, which disrupts more than it focuses. See also Vision Critical, which does predictive analysis via social conversations. In AdAge: Why Mobile Ads Still Fail. Interesting look into the industry and related statistics. Is it because we just don't want them on our phone? Having better terminology for innovation, like it is for many things, makes lots of sense. I find myself often getting into debates about analytics based on this. Terms can drive what is done, and the expectations for the results, as well as how to search for good examples. A short piece on the use of visualization methods at Oak Ridge Labs. 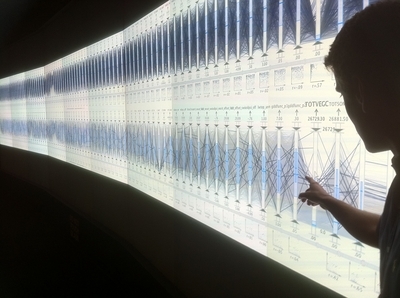 Using multiple projectors and images for analytics. Working on a project now that includes these elements. Powerful ideas for group collaboration and analysis. Shouldn't big data use big collaboration to expose it to multiple visual and analytical solutions? Looking forward to this development. Cognitive computing: IBM wants to give the smartphone 5 senses. " ... IBM believes technology's future lies in cognitive computing, which essentially means making computers think more like humans do. To IBM, that includes giving computers sensors that enable it to touch, see, hear, taste and smell - sensory input as one more piece in the puzzle to help solve problems. ... "
Another interesting piece by Steve Miller on the use of social science data. We are at the edge of doing some very interesting data derived from our new devices. And see recent blog posts on the democratization of that data. The implications? In AdAge: Nielsen and Twitter establish new method to rate TV. " ... The "Nielsen Twitter TV Rating" will measure audiences for social TV activity on Twitter, including people who comment and people exposed to their comments.,,, "
DARPA continues to push open source technology solutions, leading to more agile and modular systems, which can lead to even broader democratization of data and systems. " ... This fall, the (retired) eighth Vice Chairman of the Joint Chiefs of Staff described a potential future of the military that’s founded not only in open source thinking, but in next-generation user interfaces and biohacking straight out of science fiction. If even some of the strategic thinking he described at this year’s Military Open Source Conference in D.C. is applied to how the technology that supports the next generation of war fighters is built, dramatic evolutionary changes could cascade down the entire supply chain of one of the world’s biggest organizations ... "
Note my involvement in and coverage of the DARPA XData big data evaluation project. More here. Newly discovered site and blog: Brick Meets Click. " ... Thought-leading perspective on how technology is changing the future of shopping. A strategic resource for retailers, suppliers, & technology providers ... "
Philip M. Parker, Professor of Marketing at INSEAD Business School, has had a side project for over 10 years. He’s created a computer system that can write books about specific subjects in about 20 minutes. The patented algorithm has so far generated hundreds of thousands of books. In fact, Amazon lists over 100,000 books attributed to Parker, and over 700,000 works listed for his company, ICON Group International, Inc. This doesn’t include the private works, such as internal reports, created for companies or licensing of the system itself through a separate entity called EdgeMaven Media. ... Parker is not so much an author as a compiler, but the end result is the same: boatloads of written works. ... "
Nanodot, the Foresight Institute's informative nanotechnology blog. We used some of their resources in the early days of nano tech for product development. Always worth following. ... Foresight Institute is a leading think tank and public interest organization focused on transformative future technologies. Founded in 1986, its mission is to discover and promote the upsides, and help avoid the dangers, of nanotechnology, AI, biotech, and similar life-changing developments. Foresight is the primary force pushing for the kind of nanotechnology that will truly transform our future, from medicine to the environment to space settlement. We bring that vision and goal to new audiences, including inspiring young researchers ... "
They are in a fund raiser now. I was invited to a presentation by Intuit and Emergent Research last week. Intuit presented an excellent view of how they were addressing the world of big data. This is a followup of work we did earlier this year to address the changing views of and access to big data. Brad Smith, CEO of Intuit, spoke of how they believe that the coming era will embody 'Big Data for the Little Guy', and that Intuit is particularly well positioned for this since they are already engaging with consumers and small business effectively with database and analytics technologies. In particular this includes the ability to democratize data that is now available from many sources: Government, industry groups, social entities, and even the output of analytical models that address focused needs. Previously this ability was available only to the largest of sophisticated companies, like my former enterprise. There we constructed models to drive specific understanding of the context of the world and interacting businesses. Every consumer and the smallest company should now have the same capability. Today, methods like data visualization, rule based process modeling, and embedded decision analytics are all available to connect the consumer, small business and their customers. A mix of data science and analytic techniques provide new ways to solve difficult problems. Problems whose solutions are often volatile over time. There will be challenges to these approaches, but all the tools are here today. The connection of decision architectures to tools and social networks will be one challenge. The delivery of supported and understandable analytic expertise to the consumer will be another. I plan to post more about this work as it emerges. Look for that here. The joint research study provides more detail about the approach. The Brad Smith round table presentation is here. A telling view in Xconomy with considerable background information concerning Google's knowledge graph work. Positioning it as a 'second brain', to avoid coming up empty in the context of a search. Getting closer to at least the way our brain works. We seek the obvious match, access the credibility of the results, try analogies, differing paths to results, ask experts in the field. But we are not machines so we cannot be quite so precise. But we do now have an advanced search to help us achieve something similar. Always some interesting posts, that they are now also publishing in a weekly format. I have rarely contributed, but read it often. Often quote it here. Thanks to my former colleagues for setting it up. M J Perry on the decline of global manufacturing. Is it something we should be concerned about? I see his point, but there are things that will have to be manufactured to support our needs. Just two years after this computer was brought out, in 1979, we used the IBM 5120 with our CEO to test the idea of an executive information system. The system delivered focused sales data and visualizations that helped plan the direction of the company. This idea eventually led to things like the Business Sphere, now in the process of broader commercialization. Who would guess where the idea of portability would go? We carry with us far more powerful and broadly networked devices. Whats next? In Computing Now: An overview of what Microsoft is doing in the enterprise, Microsoft Dynamics, its connection to Windows 8, interfaces and all of their enterprise offerings. A look at the overall infrastructure and the investments that are included. The futurist proposer of the approach of an inevitable people-machine singularity, Ray Kurzweil, has joined Google as an employee. In GigaOM. Apparently to work on machine learning and language processing. Given the long time interest of the Google founders and the company itself on AI related topics, this sounds like a logical step. Note also, the Singularity University. An interesting interaction between odor and sound in sleep. Non conscious interaction between senses and the brain in contexts. " ... Sleep appears to play a key role in helping the brain consolidate the memories it forms during the day. While past research has indicated that you can't form new memories during sleep, a new study has found that the brain can establish new associations while sleeping. There's a catch, though: its capacity may be limited to certain types of memories—in this case, ones associated with the sense of smell.... "
QThru, another example of aisle checkout, here is described in Geekwire. Another example of this general play, described here previously, is AisleBuyer. Store check out line wait, often sited by shoppers as a problem, and the required labor to service them, is a major element of retail cost. It makes much sense to utilize the smartphone as a personal scanning device to gather this information before check out. See also, indoor mapping, another sensor based retail smartphone application. In Adage: What seem like some good advice. On Facebook, engage with your super fans and help them go viral with two way communications. Engage mavens and communicators. A colleague - correspondent writes: I was very sad to read that inventor Norman Joseph Woodland died aged 91 on Sunday. Some fascinating statistics regarding the 'App Economy' and how it varies regionally. Working with startups it is frequently the complaint that we could better programming and technology skills on the coasts rather than in Ohio. You would pay more for it as well. At the recent CFO Dimensions conference in Chicago I was invited to interview a number of CFO participants for the CFO Intellectual Exchange Network (IXN). There I met Thack Brown, SVP and CFO of SAP Latin America. He had participated in a panel discussion about the evolving role of the CFO in the technological enterprise. Priorities are about managing growth and dealing with risk. I was immediately impressed by how much he was interested in the value of emergent technologies, my own specialty. Today the CFO is responsible for more cost cutting and governance needs within the enterprise than ever before. They also have to work with executives and members of the board who today use many technologies that they were removed from in the past. They use these same technologies themselves to communicate with and analyze massive amounts of data. Further, as CFOs of a well known technology company, they act as examples of how these rapidly changing technologies can provide real value. Mr Brown emphasized the need for his role to both understand the needs of his region, the interaction with clients and employees, and the need to focus on the corporate forecast. All of this is now is increasingly done via global and mobile interaction. There are no crystal balls, but they are now more often held to financial and technological forecasts that need to be made and met. It is often necessary to quickly bring together teams to solve both strategic and tactical problems. And to provide the right data and technological expertise to make those solutions efficient and the best possible. This all requires quick and effective collaboration to drive the solutions home. Managing risk and driving growth, key CFO responsibilities, cannot today be done without collaboration and technology. All today driven by SAP solutions in the enterprise, even within SAP itself. His own role has shown him that emerging markets are often the key to making this work. He has become impressed regarding the innovation and creativity that is coming out of Latin America, a region that is often forgotten as a nexus for enterprise technology. In the coming decades we will see more innovation and results coming from Latin America. I was very impressed by his description of how the CFO role is evolving. Its fast and it is happening everywhere. This is a very big change from when I worked with executives seeking guidance using data just a few decades ago. Today they are well aware of the power of technology, and how it is being used by every employee, from new hire, to regional CFO to CEO. In AdAge: Kroger and Unilever are among the pleased users. Some good detail here: " ... Pulse draws data not just from the million BzzAgents, but also from the Dunnhumby Continuous Panel, a group of 6 million households drawn from the Kroger shopper database and normalized to provide a national view of product sales, he said. ... Mr. Bradley said BzzAgent Pulse has proved useful across Unilever functional areas -- including sales, brand marketing, market research and research and development. ... "
A repeatable efficient process for creating and effectively deploying predictive anlalytic models in production. A non-profit organization promotes standards for making rational auditable calculations based on probability distributions. I have been a user of Google Maps since its Beta Days, where we tested it for geo data environmental and marketing applications. Now as an iOS phone and tablet user, I was dismayed to see it removed from that environment. Now it is back and I downloaded it. It brings back Streetview and turn by turn navigation. Also transit and walking directions for major cities, which I found very useful. And a direct link to Google Earth. The new user interface is simpler and nicely done. Have yet to find something I did not like. Try it. I was reminded of IdeaConnection recently. A site that connects innovative ideas and their uses. I had the opportunity to chat with them for the enterprise a few years ago. David Sibbit discusses business model visualization. A topic I love and that he instructed us on during the 1980s. Lots of collaborations, books and even a gamification of the process is discussed. I remember having a discussion with about how it would be great to construct these visualizations on a portable electronic slate. Powered by a library of objects you could choose from. The new era of the tablet makes his methods portable and transportable for both local and strategic means. A recent video and talk by former colleagues. Hardly secrets, which is what the CGT title boasts, but worth looking at for all practitioners of the science and necessarily art. " ... demand planning leaders from P&G candidly discussed how technology and process standardization is a key enabler for the rapid expansion of innovation ... "
In my case I did not suffer from having a small network, or not enough people willing to talk to. What I did not have was enough people willing to convert my skill and connections to paying work. Its the old sales question: How do make the conversion of just talk to sales? The video makes some suggestions that are obvious, but is always worth repeating. First, make sure you have a useful value proposition for the business involved. Real value. This is often different for different size businesses. What you can provide coming from a big enterprise was that was successful using you expertise is a tried and true method at much less cost. Next, once you have identified a potential user of your capabilities: Connect/Meet and Repeat. Build trust, start small, and show intermediate value. I like to use visual charting methods to describe how you can understand their business and increase their value. Start with the simplest methods. Build to complex analytics. Always measure and show results with a followup. Make sure you have a useful online presence, no matter how small you are. A web site is good. A blog or twitter presence also helps, because it shows you are active in your area of expertise. Post presentations, invitations to meet at local conferences, offer to talk at group meetings. I have seen this many times, you shop or search for something online and you start to get lots of offers for more information. In the WSJ: How they Know What you are Shopping For How this works. A way to broker college courses directly from professors to the student. So whats a college for? " .... In yet another step toward democratizing higher education, Straighterline, a pioneering provider of accredited, low-cost, self-paced online college courses, has started a new feature called "Professor Direct." The program--which will be eligible for college credit through the American Council on Education--gives professors the option to teach courses directly to students.... "
"... For many data scientists, innovation is just out of reach. They might have massive data stores, rich with potential business insights, but their reporting system can’t unlock them. “Traditional reporting systems are good at giving information about what happened in my business yesterday, but they’re not good at nearly real-time or predictive analytics,” says Saum Mathur, CIO of HP Software. “They can’t really tell me what customers are thinking today or how I can improve my business tomorrow. To innovate and keep an organization moving in the right direction, that’s just not enough.” This waste of a big data opportunity is a crossroads for information management executives, who must rally their organizations around the pressing need for business intelligence agility. Those who use next-generation analytics tools to transform the business and improve the bottom line will succeed.. .. "
In Progressive Grocer: A study: " ... A study of shopper-marketing trends by Brick Meets Click found that more shoppers are using digital platforms and are willing to share personal data. Looking forward, more digital platforms might aggregate offers and focus on problems important to shoppers, such as health and the environment ... "
" ... Shopper insights are here to stay, according to RetailWire’s recently conducted study of industry professionals and practitioners, and are quickly becoming a “must-have” feature of decision-making relative to category management, merchandising, marketing and in-store activities.In particular, shopper insights derived from specific retail accounts are seen as beneficial for fostering strong collaboration between supplier and merchant. Said one respondent: “It is the new currency to drive retailer/manufacturer collaboration to work jointly to improve the business/category.” ... "
So we clearly saw the early need for learning that was more than academic. And produced results that could be applied early to our own mix of products and could take our understanding of the consumer, for new products and new initiatives, and combine that with operational retail knowledge. This paper studies insights from a survey in late 2010: " ... The study sampled information and opinion from 593 executives and managers. Supermarket/grocery retail and manufacturer companies were most strongly represented in the sampling, and nearly half of respondents are in upper management positions. ..."
" ... both retailers and suppliers expect that manufacturers will partner relative to shopper insights with more than the number one retailer in a particular market. Indeed, only 2.5 percent of the total number of survey respondents say that a supplier should only partner with the market leader and go no further. From the supplier viewpoint, 20 percent answer that going beyond the market leader should be done to enhance more retail relationships, while 69 percent say that working with more than one retailer in a particular market should certainly be done for relationships, but also for gaining additional knowledge for HQ planning.... "
I am incorporating some of this data in a study I am doing. Please send me any further insights you have. A correspondent from Metaio sends along this press release. About their drag and drop augmented reality creation and management software, now usable via the cloud. Particularly useful if you are studying how this might be relevant to your business. In CIO Insight: Says that enterprise IT will embrace and move to the 'third platform' next year. This was a new term for me, but includes mobile, social, cloud and big data analytics. Quite a big basket of things, that have been much in the news lately. The additional costs will be large. Good take by Mike Madsen. Its about parallel data processing which is very useful for doing analytics quickly with big and volatile data sets. It does not replace analytics methods. I have had a number of conversations recently that implied this was the case. You may need a data scientist. But you also need someone who can apply analytics to the data that Hadoop has uncovered. Often not the same thing. In Neurorelay: A review of The Consumer Mind, by Pepe Martinez of Millward Brown. A company we worked with a few years ago in a conference on neuromarketing applications. The book is on my short list, glad to see it brought up here. Interested in all knowledgeable critical views of the topic The book "... provides insights based on the latest advances in neuroscience, analyzing how brands, products and communication reach the mind of the consumer, and their impact on their perceptions, instincts and cognition.... " Also the book includes a review of a number of companies and their neuro profiles. A common approach these days. On my lengthening list of papers and books to look at in detail. Colleague Paul Smith is interviewed about organizational storytelling. The other links here provide more resources in this area. " ... A dialogue on the subject of organizational storytelling; narrative as a leadership capability. 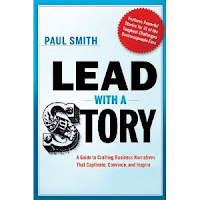 Author and story consultant David Hutchens of www.DavidHutchens.com hosts Paul Smith, Director of Consumer Research for Procter & Gamble and author of “Lead with a Story.” www.LeadWithAStory.com ... "
I like the idea of using multiple sensors to drive some sort of decision making system. Smartphones are an example of a commonly available, widely deployed sensor. Could they be connected to form a network for analyzing seismometer data to predict earthquakes? Some comments on the idea. I was involved in a project that gathered pharma sales data to attempt to detect some kinds of bio terror attacks. This work, after the input and effort of many talented people, ended up here. How might this kind of event data analysis have similarities? Nice link through to to a video on fractal organization. A long time interest of mine that we were able to use for such seemingly unrelated areas like product design. Organizations certainly do have an element of dimension that is beyond 2D ... and often vary wildly depending on how closely you examine them. The exploration of how is interesting. I see that one of my posts, on the German clothing manufacturer/retailer, has been featured in the IBM Retail Paper.li publication. I had not seen this aggregation before. It also includes job opportunities in IBM related retail. My colleague Sammy Haroon on Core Competency driven reinvention. GreenPlum report that is of interest. " ... Smart Cities are all about collaboration, sharing and transparency. They need true openness of data. It is not just governments opening up their data for everyone in public platforms. It is individual citizens and privately-owned companies offering their data to the government or government departments sharing their data with one another. That is the true meaning of ‘Open Data’, which goes beyond the traditional definitions. Because Smart Cities eat the ‘status quo’ for breakfast. They change at the speed of light, together with their environment. They are the cities of the future.... "
But this does imply that you completely trust the government. Should you? Contemporary marketing is constantly subject to challenges generated by the evolution of market relations. Promoting the holistic conception in marketing determines new theoretical and practical urges in the field. The article shapes conceptual aspects of this new challenge, i.e. neuromarketing. In the context of developing neuroscience - in general – and of neuroeconomy - particularly – one analyzes the main viewpoints of the specialized literature regarding this new field of knowledge. The new border science or simply the management tool in behavioral researches is the key question that authors are confronted with. Investigation techniques used by neuromarketing are subject to a comparative analysis, from the viewpoint of their applications in marketing research. The ideas of the study are completed by examples on applicative issues and the ethics issue in neuromarketing. By causing changes in the physical aspect of marketing researchers, the new field opens a new path to accessing, in depth, the buyer’s behavioral decision mechanism. Click Through for Full Paper. With my food and retail background and interests I found an interesting mention in this AdAge article. It is rare to see plays regarding the food industry using analytical methods. The article describes how Food Genius is partnering with the Food network. What do they do? " .... pitched a vision of using big data to make all of Food Network's digital properties smarter, creating a more personally-relevant experience for consumers looking for recipes, ingredients or restaurants. The Chicago-based company closed a $1.2 million financing round in July with funding from Hyde Park Venture Partners, New World Ventures, Amicus Capital and IDEO ... " " ... Using Food Genius Reports, you can explore ingredient trends and discover deep context about how those ingredients, as well as preparation methods, and sensory language are utilized with the most comprehensive database of restaurant menus ... "
In Progressive Grocer: " ... Five years after its widely publicized U.S. debut, British supermarket operator Tesco is embarking on a strategic review of its beleaguered Fresh & Easy chain that has struggled to turn a profit from the outset. ... “It is now clear that Fresh & Easy will not deliver acceptable shareholder returns on an appropriate timeframe in its current form,” said Philip Clarke, Tesco’s chief executive, who noted the mandate before him to deliver long-term shareholder value since his appointment as CEO last year. ... "
In SciDigest. Good point, graphically delivered. Inventory optimization analytics is first looked at tactically, but there us usually benefit in taking it to the strategic level. Practically, from my experience, it is usually good to consider the latter while working on the former, so you do not paint yourself into expensive corners. This advice is good for many types of analytics. I have been looking at both engaging and value adding plays for the midsize business in loyalty systems. I was pointed by the IBM Midsize group to the work by the 355 year old German clothing fashion retail firm Gewandhaus Gruber to their use of a biometric, fingerprint method for identifying, engaging and converting customers. See their explanatory video here, in German, with English subtitles. We had done some work in understanding a number of biometric methods of consumer identification, including fingerprints. We were particularly interested in how the North American consumer would react to the fingerprint ID method. We were not interested in loyalty systems at the time, but rather in the actual reaction of the consumer to a method associated with police work. The article is interesting in position the method and the data gathered for promotion and rewards recognition. " ... The company's latest innovation is a customer rewards program that uses fingerprint technology to distribute savings and rewards. Customers scan their finger at the register to pay for their purchases without cards or cash, plus they instantly earn loyalty points and discounts.... "
Instructive read and I am looking at this further. In CACM: A heads up display for the automobile. Providing local information for the driver. Driving directions. And connecting the driver to their network. What is dangerous distraction versus information that could make the trip more efficient and safer? Last year I posted about SAP trying to utilize external startups for innovation. I was invited to one of their meetings concerning that approach. Now they have apparently changed their strategy to focus on internal startups. The specific motivation is unclear. In Innovation Excellence: A discussion of risk and responsibility in innovation. Using innovation in nanotechnology as an example, from the insurance industry. There have been a number of attempts at using the enthusiasm and engagement seen with the use of games to deliver learning. Here is an example. Here for standardized test preparation.Though I have never seen this successfully used in the enterprise. Anyone know of an example?
" ... Indoor mapping: a retail myth, up until now. Meridian, a Portland, Oregon-based mobile software company is seeking to change that, all with the help of magical, pulsing blue dot. The company recently announced that their “glowing blue dot” feature was being prepped for a beta test in Macy’s 150,000 square-foot flagship store in New York City. The turn-by-turn navigation system at Macy’s was one of three beta-test locations, and Macy’s was the first major retailer to grab the new tech tight and resolve to never let go–in other words, to innovate their brick-and-mortar model through implementing the technology.... "
In overview article on storing away data. Just an introduction. Its not just about doing backups. We stored backups under mountains in the west. But how can you make sure you have chosen the right media, the right formats?
" ... No more guesswork. The best assortment for each location. The best assortment is the one shoppers expect to see on your shelves, but also the one that delivers the best profits. So why make guesses? IBM DemandTec Assortment Optimization offers a collaborative approach for defining localized merchandise assortments through a complete understanding of what drives buying decisions – incorporating shopper demand, space, productivity, and profitability. .... Now you can offer items that meet unique demands or targeted shopper segments. You'll know exactly which items you can replace or substitute for other items in your portfolio. Most importantly, you'll understand the implications of various assortments on each customer segment. With one common view of the shopper, their decision trees, and the marginal additional value of each SKU to the equation, manufacturers and retailers can work together more effectively to delight shoppers and build customer loyalty. ... "
An interesting piece out of GigaOM interviews media chef Alton Brown about using social media constructs to file and adapt food recipes. The link points to a video that broadly outlines the idea. I am an amateur chef, and have a long time interest in the history of cooking and how recipes have been used to record the knowledge of cooking. Also, related and just reading, see Bee Wilson's recent book: Consider the Fork: A History of How We Cook and Eat. Which addresses the history of cooking and its technology. Brown's idea is interesting. But when I perform any kind of task, like cooking. I want the fundamental 'objects' to be done correctly, expertly, professionally. Then I would like to be able to connect together these pieces together to form a recipe that I am constructing or adapting. Some of the methods used in Object Oriented Programming for software development should be examined as starting points. Be glad to review any thoughts on this. In Supermarket News: " ... Haggen and other retailers are showing how to collaborate with trading partners on mutually rewarding promotional and merchandising initiatives. ... "
In Linkedin: Tim Brown, CEO of IDEO on creative confidence, with some useful links as well. " ... creative confidence is the ability to come up with breakthrough ideas, combined with the courage to act. Individuals with creative confidence live up to their potential to identify and launch creative solutions that solve unmet needs and create maximum impact on the world around them ... "
I recall a conversation with an eye doctor a long time ago who swore to the use of eye exercises for improving vision. Can games be used as simulations to specifically improve the muscles in the eye? An exploration. Adage makes the breathless claim that even Consumer Package Goods firms (CPGs) are now seeking data scientists. Well excuse me, they have always used data scientists, ever since such roles have been defined. CPG companies have always been part and parcel of being part of the generation, and the use of massive amounts of complex data. Kleiner Perkins provides lots of interesting data regarding the Internet at the end of the year. Always thought provoking and useful for presentations. In Progressive Grocer: On the integration of digital and non digital research. Perhaps obvious, but it is well put here. In particular how increasingly granular data can lead us to deeper insights. Had another excellent interaction with John Milby, CEO of the startup Full Scale Virtual Research,which uses some of the technology developed at Procter & Gamble and has extended it considerably to virtualize consumer research in a number of new and exciting ways. In the picture shown here, from his latest slide show, a shopper interacts with a shelf, points at a package and is able to read the text on the package. All with full scale, very high resolution images. Other aspects of the interaction can include how a shopper might use smartphone and tablet interaction with shelf information. See this space for more information about their progress. From KurzweilAI: More on deep learning. On the future of bio inspired neural network infrastructure intelligence. We creep closer to human intelligence by learning. An interview with " ... Dr. Jürgen Schmidhuber is Director of the Swiss Artificial Intelligence Lab, IDSIA. His research team’s artificial neural networks (NNs) have won many international awards, and recently were the first to achieve human-competitive performance on various benchmark data sets. I asked him about their secrets of success. ... "
It is suggested that the data associated with payment is more valuable than the any payment fees themselves. More. " .. Tomorrow: Payment Data Will Revolutionize Commerce & Advertising ... As society goes increasingly cashless, payment companies will have a larger business, and a more valuable one, in closing the loop for offline transactions and helping deliver customers. The data they possess is without equal; did somebody buy something? How much did he spend? What did she buy? Paper money cannot be tracked in this manner. In order for Online-to-Offline commerce to take flight, every merchant needs an ability to track online/mobile action to offline purchase, and PayPal Here, Square, GoPayment and others could provide just this for a whole new class of small merchants. ... "
In GigaOM: Had not thought of all the issues brought up here. Certainly they are all in play to some degree, but there are not enough statistics to understand if the critics are right or wrong. Well worth reading for anyone who is using doing mobile commerce. Read the comments too. The next Internet Frontier? Wouldn't you like to have voice data searchable, findable and sharable, in any language? Imagine podcasts, speeches and voice consumer comments, all linked together for easy reference and especially for semantic analysis. Here is a good introduction to the concept and standards being worked, with additional useful links. And " ... Announcing the launch of the Hypervoice Consortium to provide a forum to define standards, capabilities and applications for Hypervoice conversations ... "
In Technology Review: Turning any surface into a computer interface with an augmented light bulb. I like the simplification. A topic close to home recently. I have now featured the technological aspects of this in several talks I have given. An opportunity to use new tech and social interaction to integrate medical professionals, non professional family members, mobile devices, sensors, predictive analytics and AI to make a difference in health care. As in all efforts that deal with large and complex systems,it makes sense to start with simple problems. This HBR article does a good job in making the case. Obvious, but useful to say. Still it is not always easy to find the simple solution for a problem. Something as simple as plotting some data can often be a great place to start, because it makes you look at the basic structure of the data, and its relationship to other data. Start there. In CIO: Word that the office services store will start to print 3D items. A method promoting remote manufacture. This development could lead to the increasing use of the idea for select products. " ... Customers are expected to create 3D customized parts, prototypes, art objects, architectural models, medical models, tools, machine components, robot parts, or 3D maps, among other purposes.... The Staples 3D models will use the Mcor Technologies IRIS printer, which Staples and Mcor said had the highest color capability of any 3D printer in the industry and the lowest operating cost of any commercial class 3D printer. Mcor also said its 3D printers are the only ones to use ordinary business letter paper as the layering build material.... "
Our own enterprise was devoted to the art and science of being shopper centric. Decades of research allowed us to leverage that capability against the needs of the consumer. Centricity was the key to making the system work effectively. I discovered this piece in the Demandtec/IBM site which coves some of the same concepts. And mirrors some of our own thinking. They write: " ... Of course each shopper is unique – and supporting shopper centricity gives you and your trading partners a competitive edge. But how do you actually harness key insights on the value of the shopper? How do you offer the best rewards that truly excite consumers and drive long-term growth? ... "
Deliver actionable shopper insights at the point of decision ... "
Utilizing new ideas at the point of decision was particularly important. The First-moment-of-Truth was preached as the means to success. As the first moment of truth crept to different contexts and media, such as mobile and online, the adjustments were made to capture these places with new designs and measure the results with the right data. Note this is by its nature a big 'big data problem' (Volume, volatile, complex and real-time). The dive using analytics needs to be deep, with the latest technologies. We continue to win with these methods. Michael Stonebraker continues his useful set of of articles on the meaning of the term. The term directly includes the volume part, but we frequently forget other frequently present aspects of its complexity. In talks I give and conversations I have with analytical practitioners we often have to clarify why other aspects of 'big data' are just as important. Recommended series to clarify these aspects. Part III of the series. In Progressive Grocer: How BJ's is using a real-time shopper feedback system. " ... BJ's Wholesale Club is using a survey platform from On The Spot Systems that provides real-time feedback from members who use mobile devices to take surveys about private-label products. "Survey On The Spot's real-time, actionable feedback model will allow BJ's to know what its customers are thinking at that most critical moment, while they are actively consuming the products -- allowing the company to make immediate decisions to build stronger relationships with its members," said Ken Kimmel, president of On The Spot ... "
Announced today. Columbus, Ohio event. Brought to my attention recently and of interest. There was an online video session today I was unable to attend. " ... This partnership between Columbus 2020 and IBM will help grow the economy by ensuring that existing companies are thriving, that the world’s leading companies are attracted to the region, and that innovations are cultivated and commercialized. IBM will launch the client center – which will be home to some of the best and brightest minds in the IT industry – as its first dedicated advanced analytics center. This client center joins IBM’s network of more than 200 other client centers around the globe, and is the first in Ohio. Columbus 2020 is a public-private partnership that leverages the strengths of central Ohio’s research and academic institutions and diverse industries to position the Columbus Region as a national leader in dynamic economic development. The IBM Client Center is key in achieving this as it will be exclusively focused on the “design, build, manage, and support” model to respond to customers’ analytics challenges.... " . IEEE Spectrum has just published an publication App that surveys a number of robots and robotic applications. This appears to be only available for the iPad systems at this time. Whimsical at times, but some excellent examples, some of which I had not seen. Would have liked more links to fundamental papers on the subject. Costs $4.99 " ... Robots have long captured our imagination. Now a new iPad app will show how robots are becoming reality. Robots for iPad, a fun and engaging app featuring the world’s coolest robots, is now available in Apple’s App Store. Created by IEEE Spectrum, the award-winning technology magazine, the app lets users explore 126 robots from 19 countries, with 360-degree views, interactive animations, technical specs, and hundreds of photos, videos, and articles. Among the amazing robots included in the app are Honda’s famed humanoid Asimo, NASA’s Curiosity Mars rover, and Google’s self-driving car. There are also androids, drones, exoskeletons, quadrupeds, and snake robots. The app offers countless hours of exploration and entertainment to anyone interested in learning about robotics. Robot enthusiasts can review in-depth, technical data about each robot, while beginners can learn how robots work and how to get started in robotics. Dancing humanoids, lifelike androids, and toy robots come alive on the iPad screen with the app’s interactive images. Created exclusively for the app, the interactives let users “play” with robots by spinning them 360 degrees or moving them through a variety of actions: Just by swiping the screen, a user can get the little humanoid Nao to perform tai chi or make the child robot iCub crawl back and forth. The interactives offer a unique, hands-on experience that’s possible only with the iPad. ... "
" ... Pretty much everything I'm doing now falls under the broad umbrella that I'd call collective intelligence. What does collective intelligence mean? It's important to realize that intelligence is not just something that happens inside individual brains. It also arises with groups of individuals. In fact, I'd define collective intelligence as groups of individuals acting collectively in ways that seem intelligent. By that definition, of course, collective intelligence has been around for a very long time. Families, companies, countries, and armies: those are all examples of groups of people working together in ways that at least sometimes seem intelligent.... "
Much has been heard about the 'Google Glasses' idea of letting someone experience a place overlaid with a computer screen. We examined eye tracking and Neuromarketing approaches that overlay what a person is looking at and non conscious sensor readings. Here the story is about researcher Steve Mann, who we also followed, who has been researching some of these Cyborg methods for some time. And then was confronted by store employees in France for potential privacy infringement of fellow shoppers. In one case, we examined a scenario of how a 'shopper' could move through a retail space wearing such a device while gathering behavioral data, because their backpack and ball cap and wiring would be seen as a medical device. Maybe not in France. The Internet of things, where all things have an address and can communicate. Here, word of a way you can text the concept with real things. From IBM DemandTec, a good view of the need to construct valid shopper segmentation. Why? So we can use targeting to make sure the right consumer gets the most influential message. The link goes to an infographic and further information on this concept. 1. Use advanced science and shopper segmentation to better understand shifts in consumer demand and connect with individuals and segments rather than broad markets. Merchants can now surface those insights right at the point of decision of pricing, promotion and assortment activities. By recognizing that each shopper is unique and responds differently, revolutionary merchandisers can tailor strategies to focus on their most valuable shopper segments – providing differentiation at the shelf and a real path to category growth. Invest in capabilities designed to manage the entire promotion lifecycle – from analytics to deployment. Target promotions not with a broad brush, but by shopper segment through localized and automated ad versioning across virtually all customer touchpoints. An integrated planning environment can keep your marketing counterparts on the same page as your team throughout the planning cycle, translating into greater visibility, improved quality, and ultimately more time to focus on strategic issues. Increase marketing ROI by aligning assortment, price, promotion and marketing decisions in a unified planning environment. A common platform also allows you to work more effectively with your merchandising team counterparts – helping teams to plan for category growth, new shopper attraction and behavioral impact on key shopper segments while allowing you to tailor your marketing investment to achieve financial goals..... "
New and growing. Contact us for more information. More details to follow. I am getting increasing number of Spam Comments with an author of 'Anonymous'. It is getting difficult to even scan all messages. If you would like to improve your chances of being approved for publication include an author name. If you want to get to me privately for a speaking or consulting session, use the contact information in the left hand column. I am speaking at the Rotman School of Business in Toronto this week. I will always respond to requests promptly. I will not approve comments that are not on point to this blog and the message commented on.